Bangladesh, officially the People's Republic of Bangladesh (গণপ্রজাতন্ত্রী বাংলাদেশ Gaṇaprajātantrī Bāṃlādēśa), is a country in South Asia. It shares land borders with India and Myanmar (Burma). Nepal, Bhutan and China are located near Bangladesh but do not share a border with it. The country's maritime territory in the Bay of Bengal is roughly equal to the size of its land area. Bangladesh is the world's eighth most populous country. Dhaka is its capital and largest city, followed by Chittagong which has the country's largest port. Bangladesh is a middle power and a major developing nation. Within South Asia, the country ranks first in gender equality, second in foreign exchange earnings and third in life expectancy and peacefulness. Listed as one of the Next Eleven, its economy ranks 46th in terms of nominal GDP and 29th in terms of PPP. It is one of the largest textile exporters in the world. Its major trading partners are the European Union, the United States, China, India, Japan, Malaysia and Singapore. With its strategically vital location between Southern, Eastern and Southeast Asia, Bangladesh is an important promoter of regional connectivity and cooperation. It is a founding member of SAARC, BIMSTEC, the Bangladesh-China-India-Myanmar Forum for Regional Cooperation and the Bangladesh Bhutan India Nepal Initiative. It is also a member of the Commonwealth of Nations, the Developing 8 Countries, the OIC, the Non Aligned Movement, the Group of 77 and the World Trade Organization. Bangladesh is one of the largest contributors of United Nations peacekeeping forces. Bangladesh forms the largest and eastern part of the Bengal region. Bangladeshis include people of different ethnic groups and religions. Bengalis, who speak the official Bengali language, make up 98% of the population. The politically dominant Bengali Muslims make the nation the world's third largest Muslim-majority country. Most of Bangladesh is covered by the Bengal delta, the largest delta on Earth. The country has 700 rivers and 8,046 km (5000 miles) of inland waterways. Highlands with evergreen forests are found in the northeastern and southeastern regions of the country. 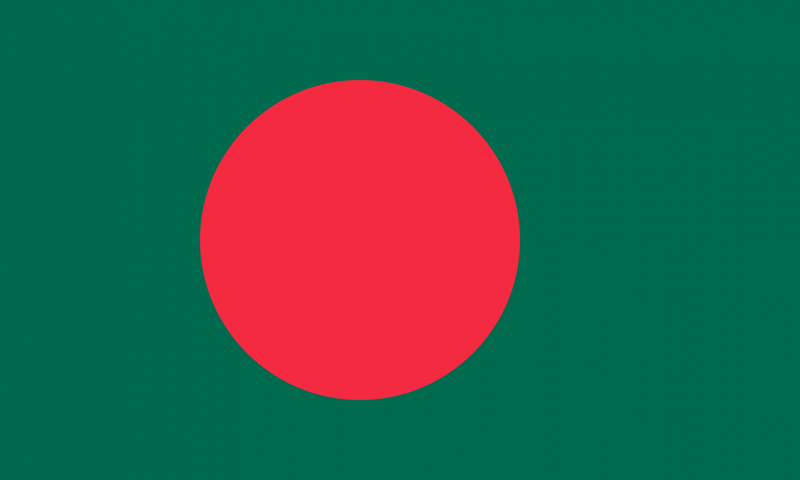 Bangladesh has many islands and a coral reef. It is home to the Sundarbans, the largest mangrove forest in the world. The country's biodiversity includes a vast array of plant and wildlife, including critically endangered Bengal tigers, the national animal. The Greeks and Romans identified the region as Gangaridai, a powerful kingdom of the historical subcontinent, in the 3rd century BCE. Archaeological research has unearthed several ancient cities in Bangladesh, which had international trade links for millennia. The Bengal Sultanate and Mughal Bengal transformed the region into a cosmopolitan Islamic imperial power between the 14th and 18th centuries. The region was home to many principalities which had inland naval prowess. It was also a notable center of the worldwide muslin and silk trade. As part of British India, the region was influenced by the Bengali renaissance and played an important role in anti colonial movements. The Partition of British India made the Muslim-majority area, East Bengal, a part of the Dominion of Pakistan and was renamed as East Pakistan. Calls for greater autonomy and animosity between the eastern and western wings of Pakistan led to a Bengali independence movement. That movement, led by the Awami League (AL) and supported by India, won the independence war for Bangladesh in 1971, during which at least 300,000 civilians died. The region witnessed the Bengali Language Movement in 1952 and the Bangladesh Liberation War in 1971. After independence, a parliamentary republic was established. A presidential government was in place between 1975 and 1990, followed by a return to parliamentary democracy. The country has also been affected by poverty, natural disasters, hunger, dominant party systems and military coups. Sheikh Mujibur Rahman (17 March 1920 – 15 August 1975) (pictured on left) was the founding leader of Bangladesh. He served twice as the country's President and was its strongman premier between 1972 and 1975. Rahman was the leader of the Awami League. 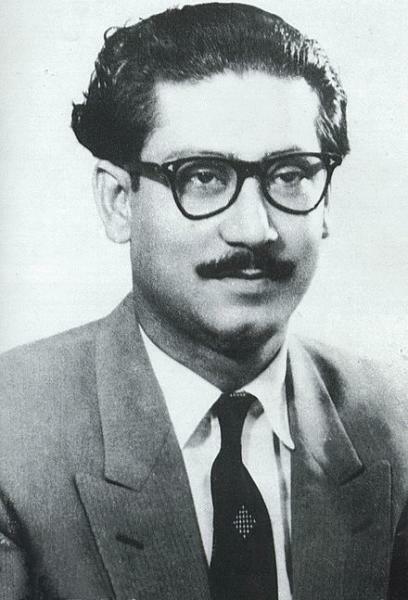 He is popularly known as the Bangabandhu (Friend of Bengal). He is credited as the central figure in Bangladesh's liberation movement and is considered the founding father of Bangladesh. His daughter Sheikh Hasina is the current Prime Minister of Bangladesh. The post-independence AL government faced daunting challenges and in 1975 was overthrown by the military, triggering a series of military coups that resulted in a military-backed government and subsequent creation of the Bangladesh Nationalist Party (BNP) in 1978. That government also ended in a coup in 1981, followed by military-backed rule until democratic elections occurred in 1991. The BNP and AL alternated in power between 1991 and 2013, with the exception of a military-backed, emergency caretaker regime that suspended parliamentary elections planned for January 2007 in an effort to reform the political system and root out corruption. That government returned the country to fully democratic rule in December 2008 with the election of the AL and Prime Minister Sheikh Hasina. In January 2014, the incumbent AL won the national election by an overwhelming majority after the BNP boycotted, extending Hasina's term as prime minister. With the help of international development assistance, Bangladesh has reduced the poverty rate from over half of the population to less than a third, achieved Millennium Development Goals for maternal and child health, and made great progress in food security since independence. The economy has grown at an annual average of about 6% over the last two decades and the country reached World Bank lower-middle income status in 2015. Bangladesh has made substantial progress in reducing poverty, supported by sustained economic growth. Based on the international poverty line of $1.90 per person per day, Bangladesh reduced poverty from 44.2 percent in 1991 to 18.5 percent in 2010, and is projected to decrease to 12.9 percent in 2016. The country achieved the MDG 1 on halving poverty five years ahead of time, with 20.5 million people rising out of poverty during the 1991-2010 period. In parallel, life expectancy, literacy rates and per capita food production have increased significantly. Progress was underpinned by strong economic growth, with 6 percent plus growth over the decade and reaching to 7.1 percent growth in 2015/2016. Rapid growth enabled Bangladesh to reach the lower middle-income country status in 2014. However, sustained growth has rapidly increased the demand for energy, transport and urbanization. Insufficient planning and investment have resulted in increasingly severe infrastructure bottlenecks. To sustain growth, Bangladesh needs urgently to implement structural reforms, expand investments in human capital, increase female labor force participation, and raise productivity through increased global value chain integration. Reducing infrastructure gaps and improving the business climate would allow new productive sectors to develop and generate jobs. Bangladesh is both an inspiration and a challenge for policymakers and practitioners of development. While the poverty reduction efforts to date have been extraordinary, Bangladesh faces daunting challenges with about 28 million people still living below the poverty line. The country is at an important juncture, when with the right policies and timely action, it can move up within the middle-income bracket. The World Bank has identified job creation as the country’s top development priority. Bangladesh needs to create more and better jobs for the 2.1 million youths entering the job market every year. But to do so, Bangladesh will need to remove the barriers to higher growth posed by low access to reliable and affordable power, poor transportation infrastructure, limited availability of serviced land, rapid urbanization and vulnerability to climate change and natural disasters, among others. Information from Bangladesh related pages on Wikipedia and the World Bank.